Once I discovered how easy they were, sock knitting quickly became my ‘Prozac Knit’. Within a few pairs, I had settled into a vanilla sock formula that I knew off by heart, with no need for a pattern. I occasionally experiment with alternative toes/heels, but keep coming back to this formula. All I need is my row counter and my knitting. I usually do a Fish Lips Kiss Heel to make the toe, knit the foot, make the FLK heel, knit the leg, and do a twisted rib at the cuff. My biggest problem is that I find it so soothing, I zone out and forget to count my rows! I have a new drug of choice project on my needles that does’t require me to carry a pattern around, or even count rows. It’s a Sock Yarn Blanket and it should carry a warning on the pattern, because it’s completely addictive! I’ve made a couple of modifications to the pattern. Firstly, the square itself – on the Wrong Side, I purl the centre stitch. 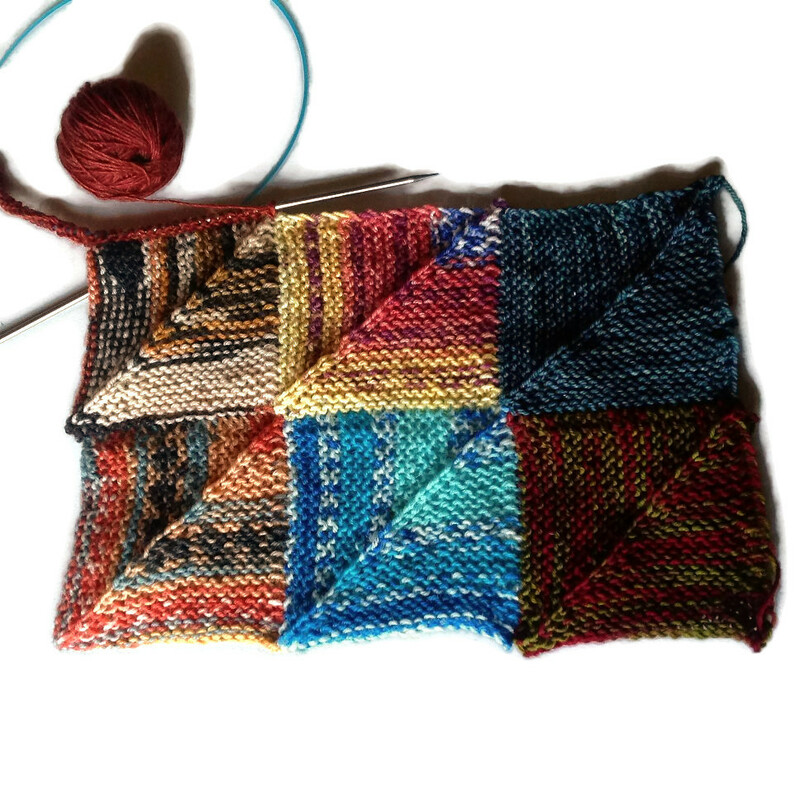 Also, as you can see from the photo, I’m building my squares up to form a square – this is mostly because I haven’t decided how big to make it. Since I took the photo yesterday, I now have 9 squares. I will start adding new squares at the bottom left and add them along the bottom, then I will start adding squares at the top right, then add them down the side. I’m toying with the idea of adding larger squares in there, too, just to mix things up a bit. Although I’ve knitted quite a few pairs of socks, suddenly my colour options for the next square felt quite limited. 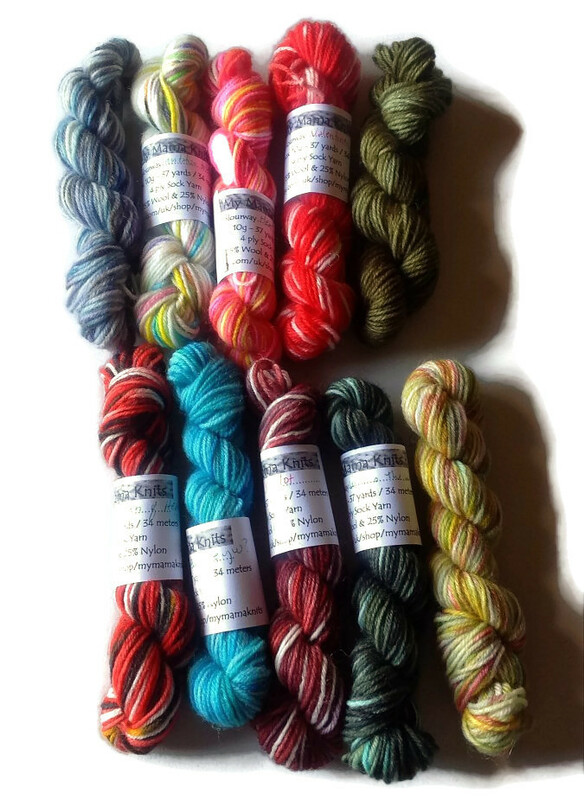 To augment my scrap stash, I broke my yarn diet and ordered some mini skeins from My Mama Knits. I’ve also signed up for a mini skein swap on Ravelry and am hoping to organise one on Facebook, too. I also remembered that ages ago, I ordered several different colours of Drops Fabel and Drops Delight and started crocheting squares, so I’ve raided that stash too. All of a sudden I’m spoilt for choice! I suspect that the end result will end up looking like an explosion in a paint factory, but I’m really enjoying the anarchy of reaching for the next ball of wool that clashes outrageously. I know that the finished blanket will be light and warm and I can’t wait until it’s big enough to snooze test.